A sweet customer of ours named Rina posted a photo of one of our candles recently over on our facebook group page. I couldn't believe my eyes when I saw that the photo she posted was of a candle that we use to carry 15 plus years ago, she actually had the candle tucked away in her Hope Chest for the last 15 years! She had just lit the candle and posted the picture when I saw it and I immediatly asked her if I could purchase the candle back from her because even I didn't have a candle from 15 years ago. She graciously agreed and put it in the mail to me that day. This candle brought back a flood of memories, as the tears flowed I reminised on how far we have come over the past 20 years. This little candle evoked so many emotions, memories of how little our girls where when I started CBV, memories of making candles on my kitchen stove, memories of the little shop Candleman built me behind our home, so many amazing memories that were all lovingly tucked away inside this one little candle. 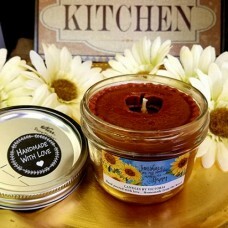 I knew that I would have to recreate this candle, the jars were easy they still make those, the label was more difficult, I couldn't find it so instead we went with this adorable Sunflower label as a nod to my daughter Chelsea and her favorite flower and the pie crust mold, I still had it. We have come a long way in 20 years, we have built something amazing as a family and with the love and support of all of you, thank you for coming with us on this incrediable journey, I love you all! 8 oz. Wide Mouth Jar, super great throw with this candle! The wax pie crust topper will always come in the fragrance Granny's Pie Crust. *The photos with the God Bless This Home label is the original candle from 15 years ago, it is proudly displayed in my home. The scent is Blueberry Patch a scent we still carry to this day.